I discovered this enormous coffee mug in a U.S. hotel room this week. My post's title has nothing to do with New Orleans (for which The Big Easy is a frequent nickname). 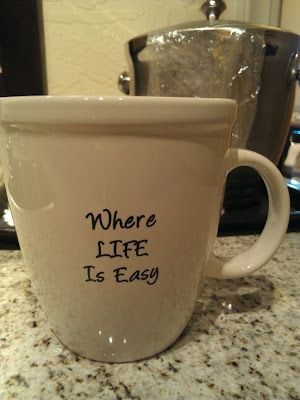 Instead, big (and) easy is the most apt characterization I can come up with right now, for my family's impressions of U.S. life after 2 1/2 French years. Life is BIG and life is EASY here. U.S streets, freeway lanes, grocery store aisles, ovens, refrigerators, even the toilet paper rolls seem very big. Driving and riding is easy; I don't stop at toll booths (the new ones in WA state automatically take a picture and deduct my toll) nor is the car slowing and speeding up with the constant shifting at the countless traffic roundabouts on French roads. I now drive along wide American allées in an extremely comfortable and automatic shift German sedan (in a model redesigned for the U.S. market, yes, to be bigger and wider). I can steer with one hand, and if I want to make a phone call, I simply say CALL HOME to the steering wheel which connect to the phone in my purse. My children's first impressions have been less about the big and easy, but more about how easy-friendly everyone seems. School administrative staff and sports coaches welcomed them with practically open arms, kids they don't even think they know are waving to them from the streets, and grocery clerks chitchat with us and already know we've returned from France. On the other hand, I'm having a hard time getting used to no bises (cheek kisses), particularly from my kids' friends. In France, I was ALWAYS greeted with two cheek kisses by the boys' friends (not to mention all of their sports' teammates and the teammates' parents), but now I'm not sure I'd get much eye contact with some if I wasn't so insistent on hugging the kids I haven't seen in two years. Right now, my family has the opportunity to view our society from an almost outsider's perspective. I try to introduce a similar perspective to my students, particularly those who have not had the experience of visiting or living in another society. It's one way to begin recognizing the ways in which social context affects people's behaviors, beliefs and attitudes. Like in France, where we discovered the cultural penchant for languid meal times and parties, we learned a lot about French attitudes towards the use of time. In the U.S. we are seeing lots of bigness and ease and that colors how the people in this society think and behave. Seeing the ways in which context influences society also shows us that no society is perfect and no way of living is the best way. For example, those leisurely French meals, in restaurants especially, were often very expensive ones with painfully slow and inattentive service. In the U.S. where we've been in the car a lot in the short time we've been here (it's the first time in my teenagers' lives that they are being driven to school daily), we are noticing that we are using our bodies much less than we had to in France. I have hardly walked anywhere and definitely not laden with bags. Baggers/clerks or I wheel my grocery bags out and lift them into my car's trunk and then I drive them home and carry them just a few meters from the driveway to the house. There has been none of the complicated and physically-demanding routine of dropping grocery bags off on an old, old street, to the ground floor of an old, old apartment building and then circling around to get on the one-way ring road to my tiny parking space into which I had to do some precision car handling before schlepping bags up three flights of stairs and then fitting everything into a narrow refrigerator. Now, I have to actually create opportunities to get daily exercise instead of getting them as part of my daily routine. One son also recognized that he was slipping into the American all day snacking habit, with all those chips and crackers and other manufactured 'foods' that come in much bigger and more convenient packages than in France. Luckily for us because of our experience abroad, we can choose from several different behavioral patterns and customs that might better suit us or that we like, even if they don't quite fit the social context in which we now live. We did this in France after many months of baguettes and croissants, by adding protein to our breakfasts, U.S. style, while here we can try countering the big and easy U.S. tendency to eat all the time with the French pattern of just a single small goûter (a light snack around 16:00 or 17:00, after school) and an entrée (a small appetizer) followed by a late dinner. And there is that nightly glass of wine....but come to think of it, I enjoyed that even before I went to France. Great to hear from you! I bet it`s a big difference between Aix and Seattle... :) Take care! Suuret kiitokset näistä asiaa pursuavista kirjoituksista. Mielenkiinnolla olen seurannut kokemuksiasi ja perheesi elämää eteläisessä Ranskassa. Toivotan hyvää jatkoa siellä kotona.